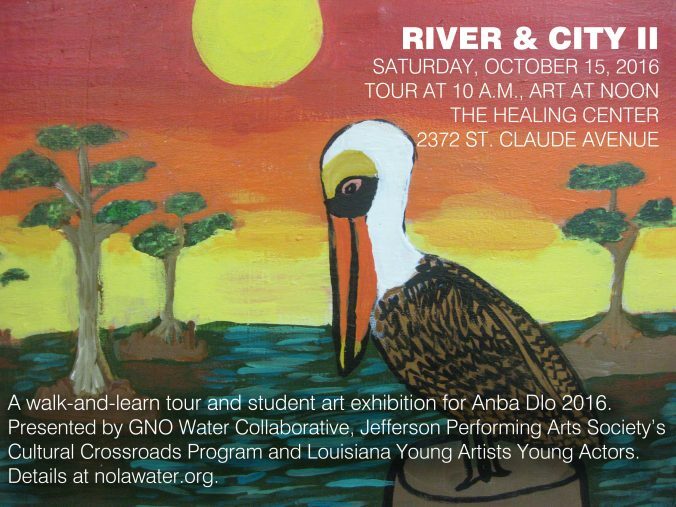 For the second year in a row, Greater New Orleans Water Collaborative hosts a River & City walk-and-learn tour as part of the Anba Dlo Halloween Festival. The 10 a.m. tour will include Crescent Park, the Groundwork Nola Earthlab, and speakers from the Port of New Orleans. It begins and ends at the Healing Center, 2372 St. Claude Ave. Wear comfortable shoes and sunscreen. Following the tour, there will be a student exhibit and performance featuring Jefferson Performing Arts Society’s Cultural Crossroads program and Louisiana Young Artists and Young Actors (LAYAYA). The students will present works inspired by their encounters with Louisiana wetlands and waterways. Also: You won’t want to miss the pre-festival symposium on Oct. 13 at 5:30 p.m. Speakers will delve into the question of how to manage the Mississippi River for restoration and commerce in an era of of coastal lanloss and climate change.